Saucy Simmered Teriyaki Tofu Bowl | What Smells So Good? Remember how I promised that I'd share some of the other things I did with San-J's Orange and Teriyaki cooking sauces? Like 3 weeks ago?? Well, I finally managed to rescue the photos and recipes from hard disk death and have the original dish ready for you - along with a second, similar dinner I made recently (more on that tomorrow!). This first meal (well, meal when you add a side of rice or noodles) came almost straight out of The Dehydrator Bible too, using not only vegetables I dried at home but a new batch of the Teriyaki Tofu "Jerky" I had made specifically for this purpose. 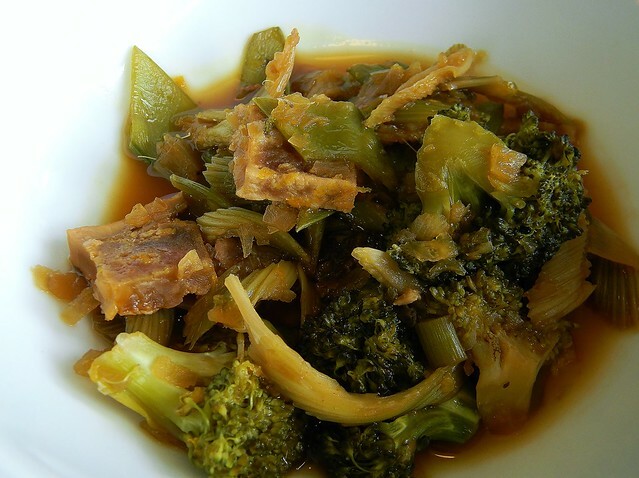 Since the author had added fresh orange flavour to the teriyaki sauce in her beef-broccoli dish, I kept with the theme, swapping in my tofu jerky for the beef in the original and adding San-J's Orange Sauce for an extra kick of citrus. It took a while for everything to rehydrate and simmer down, and the sauce was still slightly too runny for my own taste, though Mom liked sopping it up with brown sticky rice. However, the chewiness of the tofu was the opposite for us - I liked it's mouthfeel, and the fact it held the sauce well, while Mom wasn't as much of a fan. Our varied experiences proved to me that the dish is totally subjective, especially depending on what you served it with, and the fact that the flavour was still so good regardless was one of the reasons I made a second, more veggie-packed version recipe. If you have an hour or so to kill and some Teriyaki jerky on your hands, I definitely suggest simmering up this pot of gluten-free, (almost) vegan yumminess a go. Just make sure to cook up a mess of rice or some other grain, otherwise you have (an admittedly delicious) soup on your hands instead! 1 cup chopped Teriyaki Tofu "Jerky"
Bring the water, ginger, garlic, green onions, orange zest and orange juice to a simmer in a large pot and add the tofu. Simmer, uncovered, for 15 minutes, until tofu is almost rehydrated. Add the onion and celery pieces and cook 5 minutes. Add the broccoli, snow peas and sauces. Cook, stirring to coat everything, for 5-10 minutes, until broccoli is tender.